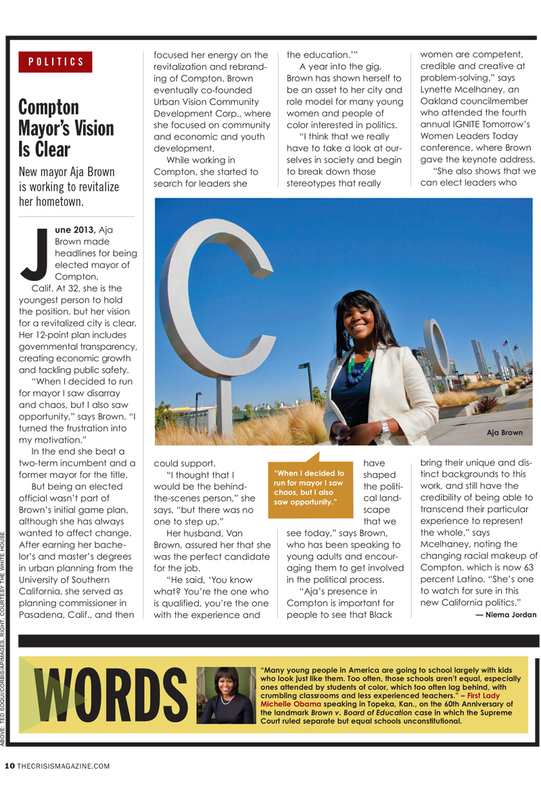 June 2013, Aja Brown made headlines for being elected mayor of Compton, Calif. At 32, she is the youngest person to hold the position, but her vision for a revitalized city is clear. Her 12-point plan includes governmental transparency, creating economic growth and tackling public safety. “When I decided to run for mayor I saw disarray and chaos, but I also saw opportunity,” says Brown. “I turned the frustration into my motivation.” In the end, she beat a two-term incumbent and a former mayor for the title. But being an elected official wasn’t part of Brown’s initial game plan, although she has always wanted to affect change. After earning her bachelor’s and master’s degrees in urban planning from the University of Southern California, she served as planning commissioner in Pasadena, Calif., and then focused her energy on the revitalization and rebranding of Compton. Brown eventually co-founded Urban Vision Community Development Corp., where she focused on community and economic and youth development. While working in Compton, she started to search for leaders she could support. “I thought that I would be the behind-the-scenes person,” she says, “but there was no one to step up.” Her husband, Van Brown, assured her that she was the perfect candidate for the job. “He said, ‘You know what? You’re the one who is qualified, you’re the one with the experience and the education.’” A year into the gig, Brown has shown herself to be an asset to her city and role model for many young women and people of color interested in politics. “I think that we really have to take a look at ourselves in society and begin to break down those stereotypes that really have shaped the political landscape that we see today,” says Brown, who has been speaking to young adults and encouraging them to get involved in the political process.